The main differentiator between the North (Tibet / China) and South (Nepal) routes to the 8848m summit Mount Everest is where the main ‘challenges’ are located along the way – on the North side, it’s the ‘second step’ – a steep rock wall now ‘simplified’ through a ladder at circ 8500m. On the South side of Everest it’s the notorious Khumbu Icefall which begins just outside of base camp at around 5400m. Seeing photographs of climbers on the South Side making their way through the icefall, basking in the sunshine, posing for photographs whilst crossing gaping blue crevasses by means of ladders roped precariously together always sparked my interest – was this the ‘true’ Everest experience?? How would I fare…? Well, having now gone through the icefall 4 x (twice up, twice down) I can sum it up quite quickly: Eeeeeek..!!!! The Khumbu Icefall looks like it was created by an exceptionally moody (perhaps PMS-ing) god-like giant who, one cold and wintery day, threw a temper tantrum and smashed a gigantic, titanic-sized block of ice and snow onto the ground (as if trying to smash a dinner plate) to create a violent, jagged, pile of precariously balanced maze of ice blocks, seracs and crevasses which shift and slide daily – and violently - in response to the movement of the glacier underneath… and swallow, smash, envelop everything and anything in its path. Standing in the middle of the icefall, looking around is a surreal experience. Whilst it’s eerily quiet, you can hear the cracking of the ice shifting beneath your feet and watch as crevasses widen and shift before your eyes. It is truly alive. It seems almost a magical, beautiful place but deceivingly dangerous – avalanches, falling seracs, ice and the shifting of the living ice beneath your feet create hazards which serve to remind you of the power of nature and the fragility of human life. It’s tempting to stop and take a photograph… but by stopping you are prolonging the amount of time you spend in this ‘garden of eden’. Icefall Doctors are employed on a regular (daily basis throughout the main Everest climbing season) to ‘tend’ to the icefall and secure a path that allows the quickest possible passage through the seemingly impenetrable maze of ice and snow. 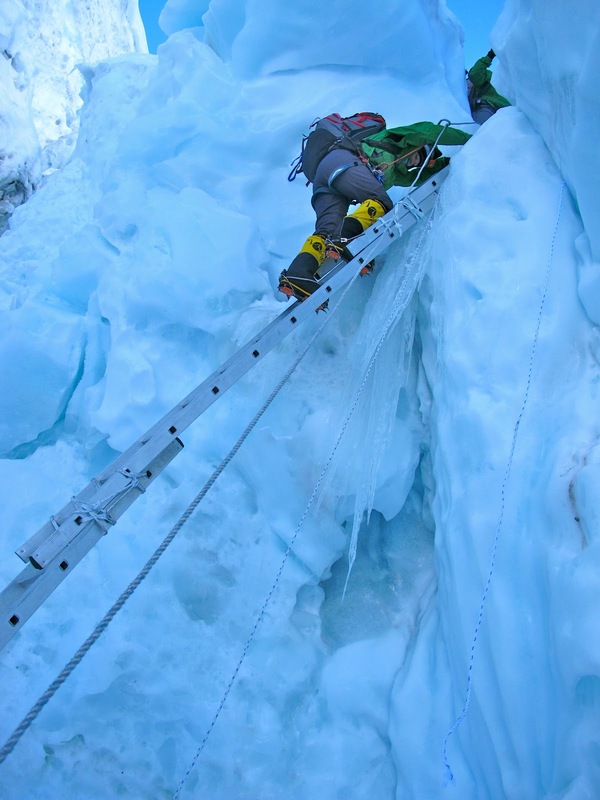 They risk their lives to travel through the icefall and set up and ensure that ladders are secured to cross the crevasses and, on a daily basis, monitor the ladders and the route to ensure that it continues to serve its purpose to provide the safest and most efficient route through the icefall. 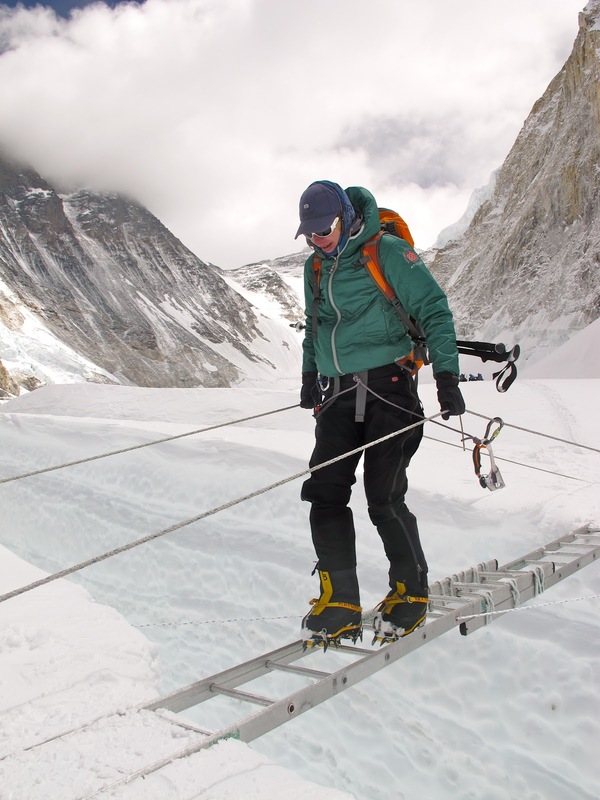 There seems to be a direct correlation between the width of the crevasses, the length of the ladders crossing them and the increase in temperature with the arrival of the imminent monsoon season. On our first rotation, I found the ladders horrible but bearable… Having said that, on our last trip through the icefall one particularly nasty, deep, seemingly endless gaping blue crevasse was made passable thanks to 4 precariously tied ladder lengths. I know it’s ‘mind over matter’ but as the points of my crampons pass over the steely rungs and I look down to see a piece of snow fall hundreds of feet, deep into the blue abyss it’s nearly impossible not to swallow and have a moment of hesitation and apprehension..! Fortunately we only have 2 more passes through the icefall – one up and one down and from that moment forward it will most certainly be an experience that I’ll most enjoy from memory and from photographs..!